Ruy Lopez | Product Categories | Vincent & Tampa Cigar Co.
Ruy Lopez Brand – Formerly one of the great Tampa Made “Clear Havana” brands, manufactured by Gradiaz Anis Cigar Company over 60 years ago. Named after the 15th century chess master “Ruy Lopez de Sigura”. Known for his skills and improvements to the game of chess that are still prominent today as well as his great passion for cigars. Vincent Ruilova purchased the Ruy Lopez brand in 1953 and began to rebuild this once popular cigar. It remained a “Clear Havana” cigar until the early 1960’s. Still made in Tampa today using All Natural Leaf Cuban Seed Tobacco for a unique mild taste. Packaged in bundles of 25 cigars, available in three different sizes. The Vanilla Supreme being the most popular with a hint of vanilla flavor. This aromatic cigar is sure to please the beginning smoker as well as the connoisseur in search of something different. 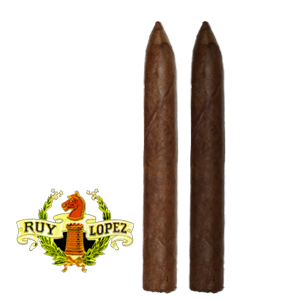 Ruy Lopez a mild and flavorful cigar at a great value for over 60 years.